Matured exclusively in hand-selected sherry oak casks, Batch Strength 002 at 58.5% ABV continues to capture the complex richness and intensity of sherry cask-matured whisky. The whisky is bottled un-chillfiltered at natural colour. Commenting on the new Batch Strength 002, Iain Weir, Marketing Director for Ian Macleod Distillers, said: “Since its initial launch last year, our Batch Strength expression has been an extremely popular addition to the Tamdhu range, winning a number of high-profile industry awards. Each batch is unique and varies slightly in style and strength but always captures the complex richness and intensity of sherry cask matured whisky. 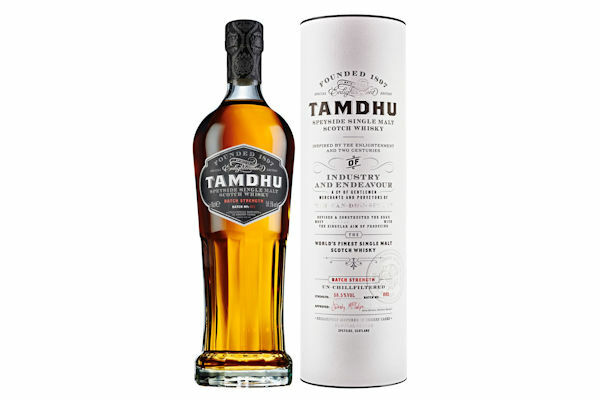 Tamdhu Batch Strength 001 took home a Double Gold Medal at the 2016 San Francisco World Spirits Competition and was also named Speyside Single Malt of the Year at the 22nd Annual Whisky Advocate Awards in December 2015.
era when anything seemed possible. When obstacles were there to be overcome, an age of the Can-Dhu-Spirit. Its quality is defined by the hint of peat in its malted barley, the natural Speyside water that is drawn directly from the Tamdhu spring and the 100% exclusive use of only the finest sherry oak casks. Palate: Mouth coating sherry oak, lightly heated berries and creamy vanilla - adding water brings out cookie dough, gentle spice and fresh fruit.